Many factors determine the health of your heart and blood vessels, especially a balanced diet low in fat and high in fibre. Sometimes we don’t eat the foods that give us the nutrients we need for optimal cardiovascular health. These nutrients include lipotropic factors and B-vitamins. Lipotropic factors help keep lipids (fats) emulsified in blood, so they may be mobilized and utilized throughout the body where needed. B-vitamins help assure proper metabolism of homocysteine, a natural metabolic by-product that can damage arteries if it accumulates. 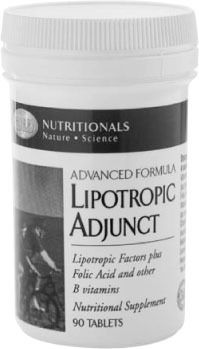 GNLD’s leading-edge Lipotropic Adjunct provides nutrients shown to play essential roles in maintaining the health of the circulatory system. Lipotropic factors are essential for the production of lipoproteins, which help keep lipids emulsified in the bloodstream. B-vitamins help assure proper metabolism of homocysteine, a natural metabolic by-product that can damage arteries if it accumulates in blood. Concentrated lipotropic factors (choline and inositol) assist the mobilization and utilization of dietary fats. Contains folic acid, vitamin B6, and vitamin B12, nutrients known to lower blood levels of homocysteine, an amino acid that can accumulate to dangerous levels and damage blood vessels. Betaine hydrochloride helps create an environment conducive to vitamin B12 absorption. Betaine is itself involved in homocysteine metabolism. Citrus bioflavonoids, including hesperidin, support the health of the circulatory system.